I should start off by saying that one of my goals in life is to be a hunter princess. 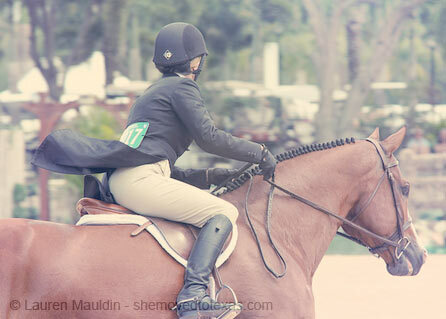 It’s completely selfish and silly, but I want all the smancy tack and clothes and I want to look polished at all times. As of now, I have a bit of a ways to go. The good news is that after years of buying the cheapest stuff possible, I have learned that quality does last. Now I do tons of shopping of quality used items on ebay, tacktrader, etc. This probably isn’t a complete list, but you’ll get the idea! RJ Classics Show Coat – I don’t know the specific kind, only that it was $300ish and was my first (and only so far) nice coat. It’s navy with a very subtle plaid. IRH Elite Helmet – I’ve had both the Elite and the Xtreme, and prefer the Xtreme. With how hot it is in Texas and how much my head sweats (I’m so ladylike and classy), the Elite just can’t handle the elements and I can’t afford a nice schooling and showing helmet at the moment. RJ Classics Wrap Collar Show Shirt – This is a new one so I could get on the ‘wrap collar’ trend I missed out on with my years not showing. It’s white and boring! Tailored Sportsman Professional Trophy Hunter Side Zip – I got these for $40 at the Consignment tack shop in Wellington. Best find! Tailored Sportsman Trophy Hunter Front Zip, Black – I say black, but I really mean faded charcoal. I got these for $20 on ebay, and they are falling apart. They probably have a handful of rides in them left, but after that it’s to the trash can I’m afraid. TS Knockoff “Trainer’s Choice” Breeches – The material is cheaper and they will catch a run, but I like these. Comfy and great for schooling. Ovation Pro Field Boots – I have these, but they are currently suffering from a busted zipper and need to go to the cobbler. When the zipper works, they’re awesome, awesome boots. Got them on clearance for $150! Dominus Close Contact Saddle – I loooooooove this saddle, and bought it used from a friend of a friend for a great deal. It is so soft and the knee rolls hug me every time I get on. However, it does not fit Simon so it’ll be for sale soon while I look for something more suitable. Red Barn Fancy Stitch Padded Bridle – My trainer in NC and friend pitched in to give me this bridle as a college graduation present. At the time I was using a $90 fancy stitch bridle that was not nearly as nice as SmartPak’s low end bridles today, and my trainer would complain about my “plether” tack every time she rode my horse. Thinline Fleece Fitted Pad With Correction Shims – I always wanted a sheepskin pad until I realized how annoying it is. My husband found this pad for me at this giant tack sale, and literally pulled it out of a stack of cheap old schooling pads and said “Isn’t this what you’ve been looking for?” It was only $100 because the fleece had been chewed by a dog in one part and I had to patch it. I love this pad and use it to help with saddle fit issues, but need to retire it to just showing only because it’s starting to yellow with daily use. Several Square Pads from SmartPak – Lots of colors and fun embroidery, my favorite being a light blue pad with a whale that says “Upton” (my maiden name). 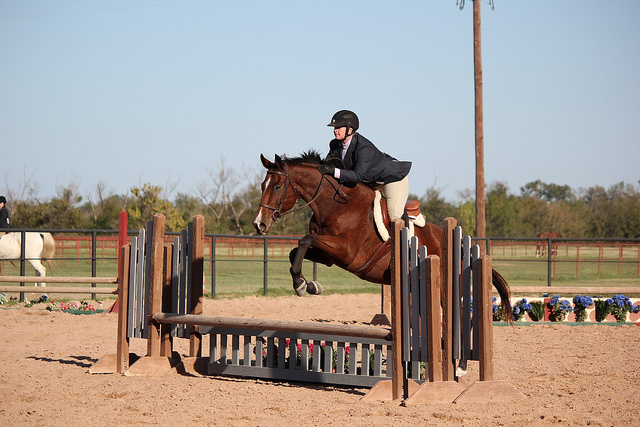 I’d like to upgrade to more hunter princess schooling pads though, so there may be a purge soon. Home made baby pads – These don’t get much use since my saddle is currently too wide, but I have made tons of baby pads. Most are white/tan, although my favorite is a Navy, Burgandy and Silver (our colors) with my initials monogrammed on them. Dover Fleece All Purpose Boots – I use these on his front for schooling on the flat, and like how easy they are to put on and keep clean. 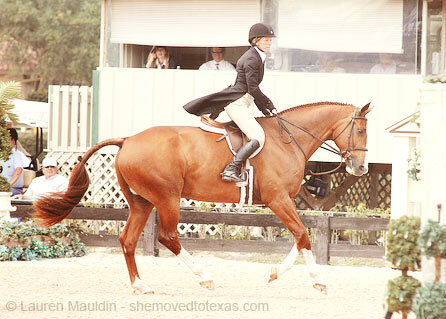 Horze Navy Open Front Boots – If you haven’t checked out Horze, they’re worth a look. Basically the Ikea of horse products, they have good priced staples. I spent $14 on these boots, and even though I need something nicer to school at in shows… I love them for at home. I could go on and on about all the other junk I have, but these are the main basics! I love horse things… i always can find something i “need” lol!!! Good luck with your saddle hunt! Hope you can find one quickly!